The penultimate public stargazing event of the 2013/14 season took place in Dalby Forest on Friday 7th February. 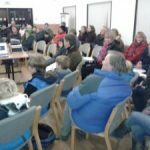 Despite mixed weather forecasts a large crowd came along on the night but unfortunately no observing was possible. Society founder and honorary president John Harper FRAS kindly gave the packed Community Resource Centre a guided tour of the night sky. Among the targets covered were the famous Pleiades star cluster, Orion Nebula and Andromeda Galaxy. In addition, Jupiter and its moons, our own Moon, double stars and a number of constellations including Orion, Taurus, Gemini and Pegasus were included. After the talk many of those attending took the opportunity to learn more about the telescopes of society members and also the chance to pick up free copies of the BBC Stargazing LIVE calendars. The final public stargazing event of the 2013/14 season takes place on Friday 7th March at 8pm. Further details can be found via our event calendar. Fingers crossed everyone for some clear skies! This entry was posted in Events, News, Public Observing and tagged Andromeda, BBC Stargazing Live, Dalby Forest, Galaxy, Gemini, John Harper FRAS, Jupiter, Moon, Nebula, Orion, Pegasus, Pleiades, Public Observing, stargazing, Taurus. Bookmark the permalink.